Phil Mickelson's stated strategy was odd, but his execution may have really been to blame for his costly triple bogey on Masters Sunday. Photo copyright Todd Kirkland/Icon SMI. No player makes you shake your head more often than Phil Mickelson, whether it’s in wonderment at stellar play, like his 30 on the back nine on Saturday at the Masters, or in exasperation at some disaster that has cost him a major title, like his triple bogey at the fourth hole on Sunday. That triple bogey wasn’t just a head-shaker, it was a head-scratcher. Very little about it made sense, especially Mickelson’s post-round explanation. 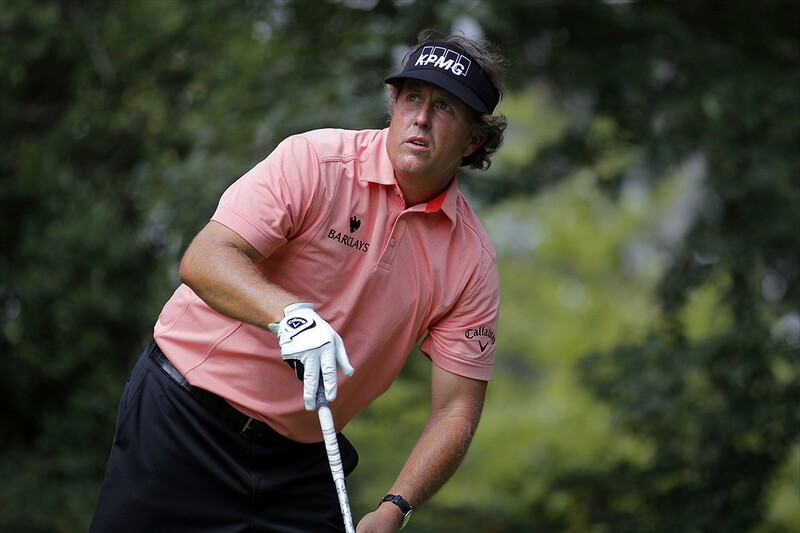 Mickelson’s defining bad moments generally fall into two categories—excessive risk taking or over-thinking. Watching this one live, it seemed like the former. Ian Baker-Finch speculated on CBS that the mistake was shooting for the flag on the narrow left front tongue of the green. And then, of course, there was the curious decision to try a right-handed shot from the jungle instead of declaring the ball unplayable and going back to the tee. Based on what Mickelson said after the round, it looked like over-thinking. The flag was on the left of the green, but he was trying to go left of the flag, he said, even if it meant missing the green. That was a curious strategy (more on that later) if that’s what he was really trying to do. But after going back and looking at a DVR of the broadcast, I think the main causes of the triple bogey were plain-old bad execution and bad luck—with some excessive risks and questionable strategy thrown in. CBS cut to the tee shot in mid-discussion between Mickelson and caddie Jim Mackay. “I want to get it to the back shelf,” Mickelson said. That would be the back shelf of the green. Nothing about wanting to keep it left. It’s possible we missed that part, but the “back shelf” comment indicates he was trying to hit the green, not aiming at the fringe or left bunker as he said after the round. The rest of the conversation centered on club selection. Mackay told Phil to wait until the wind was hurting because that’s what was needed with the 4-iron he had in his hands. I froze the action with Mickelson standing over the ball. It was a good view from directly behind the ball, and it looked to me like he was aiming at the flag or perhaps between the flag and the left edge of the green. Looking at the shot in slow-motion, it appeared that the ball left the clubface flying at the flag or a just few feet to the left of it (camera angles can be tricky but the angle was only slight). The ball ended up hitting the grandstand a good 25 or 30 yards left of that. The shot was a huge fade, perhaps pushed that way by a wind that was slightly quartering. Perhaps he was lining up at the flag and trying to fade it to the fringe or bunker, but the result of the swing was a fade more severe than anyone would plan unless they were bending it around trees; it was simply a poor shot. “Tactically, I hit that shot where I had to hit it, which is at the bunker. Anything left of the pin is fine but the right side is almost a sure bogey,” Mickelson said later. Actually, the shot didn’t go “at” the bunker. It hit the grandstand on a line a good 10 or 15 yards left of that bunker, not where he was aiming. Perhaps after the round Mickelson was in denial about making a bad swing, choosing instead to say he hit it where he wanted to. If that was his strategy (and, again, from the videotape it didn’t appear to be), it didn’t make a lot of sense. Mickelson said after the round that anything to the right of the flag, even on the green, was almost a sure bogey. But, as other players showed, if you landed the ball a little bit to the right of the flag the slope would take it to the left directly behind the hole from which point it was a fairly easy two-putt (the tee shot was nearly impossible to get close, but that’s because there was almost no way to stop the ball on the front of the green). That was the best play. Aiming left was “strategically where you have to play it to that pin on that hole,” Mickelson said. You didn’t have to play it that way. In fact, it’s safe to say that, if he did play it that way, Mickelson was the only one. Playing it toward the green, 42 of the 61 other players managed to make par or birdie (only one birdie but 41 pars). The right bunker was indeed a no-no. And it’s true it’s a hard putt if you go too far right, but still you should be able to cozy it down to no more than six feet past and have a good chance to make the uphill putt. While it wasn’t a hard bunker shot from the left bunker (as Mickelson showed with his fifth shot), let’s say a 70 percent chance of an up and down, are your chances of two-putting from the right side really worse than that? And if you miss the bunker, you could go careening down a side slope to near the grandstand—not as easy an up and down as Mickelson tried to make it sound. If you miss wildly, as Mickelson did, and end up in the grandstand, you get to drop in that same place, where bogey is more likely than par. Or you could hit the railing of the grandstand and careen to the left into the bamboo (yes, there’s bamboo over there) and underlying vegetation. That was a bad break, which is where bad luck entered the equation. Next came a questionable call. Since the two-club-length option under the unplayable ball rule wouldn’t get him a free backswing, it came down to two choices: Go back to the tee with a stroke-and-distance penalty or play it the ball as it lay. The latter option had several strikes against it. The ball was lying in some wiry growth, from which you might be sure of successfully hitting out of if you could take a hard swing. But Mickelson had almost no backswing because of some tall foliage, meaning he could generate little clubhead speed. And he was trying to make contact with a clubface that had nothing like the usual loft or hitting surface because he had to turn it upside down and play right-handed. IF he could even pull that off and move the ball a few yards, he would be left with an uphill shot over a bunker to a narrow tongue of green from an area devoid of grass where the spectators had been walking. It’s an oxymoron, but the best way I can think of to describe the lie is soft hardpan. It’s hard to see how this third shot would really give him a better chance than hitting three from the tee. Mickelson’s mindset about the tee shot—building it up to seem harder than it really is—worked against him here. More than two-thirds of the players made par on the hole, so going back to the tee meant a better chance at a five than a six. Yet Mickelson said after the round that going back to the tee “probably” meant making a six. So, the BEST-case scenario was no better than going back to the tee. And if he couldn’t pull off the unlikely shot, he was in considerably worse shape than taking stroke-and-distance. As it was, it took him two strokes to extricate the ball, leaving him in a position from which he was going to make either a six or a seven. Mickelson dumped that shot in the bunker. From there, he got up and down for his triple bogey, like Jean Van de Velde did on the 72nd hole of the 1999 British Open when he was victimized by a metal railing. It was a sand save that was too little, too late. Perhaps the only good thing about it is that Mickelson ended up two strokes, not one, out of a playoff. So the Lefty-hits-righty decision didn’t cost him a spot in the playoff, though the poor tee shot and railing ricochet did. Seemed like he was a man trying to get out of a burning building. Could have whiffed or hit himself with those hasty shots.